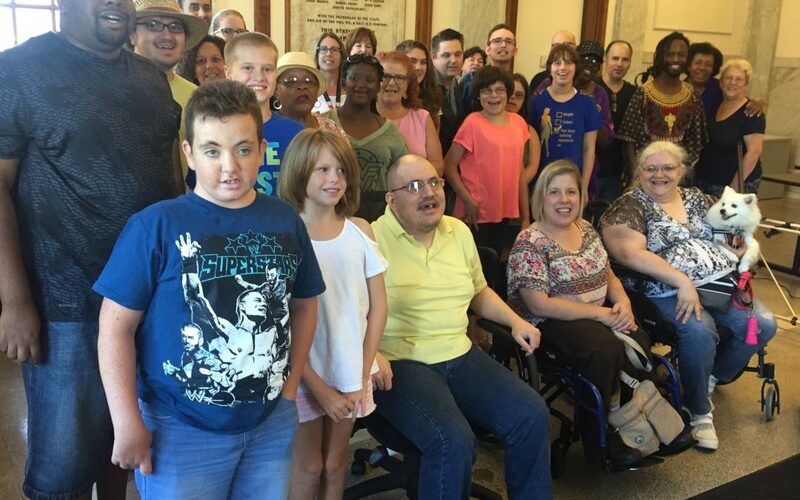 An original musical featuring a diverse cast of 27 Delawareans with disabilities, and their supporters – ranging in age from 7 to 70! Performance dates: Friday October 19, 2018 at 7 pm; Saturday, October 20, 2018, noon and 5 pm. The Dover High School Theater. Free admission; reservations required: Eventbrite: Facebook @BoundlessTheMusical. What’s the show about? In 2003, 200 people with disabilities and their advocates marched from Philadelphia, to Wilmington, through central Delaware, west to Baltimore and finally to the U.S. Capitol – to demand their rights as citizens, to be full members of their communities, and to end the practice of shutting people away in facilities. During this 2-week journey, they blocked traffic for 144 miles, and camped along the way. In our musical, we take the audience with us on the trek, and listen to campfire stories of hardship, hope, resilience and celebration.